Saturday 25th May 2013, the date that the rugby world was reminded of the core values of the game! All the Welsh must have had their hearts in their mouth, 65 minutes into a cracking game of rugby and Bradley Davies not only performs a tip tackle much worse than that of his captain at the world cup, but off the ball too, he was reacting to a shoulder charge on Adam Jones by Donnacha Ryan. This weekend saw the grudge match that is Leicester vs Northampton at Welford Road, and for some, the match proved to be every bit as tight as expected. 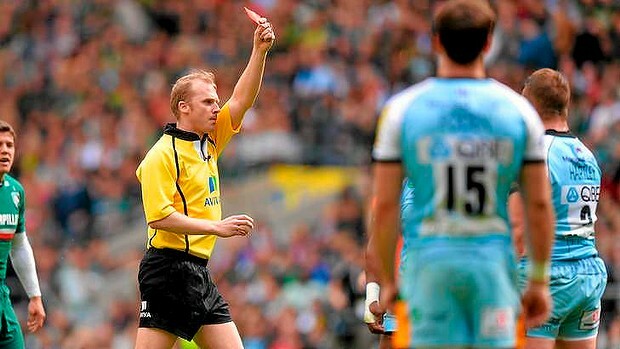 The main talking point of the game however is the two straight Red Cards that Referee Wayne Barnes gave to Alessana Tuilagi & Tom Wood, and in this article I'll look into this incident. It has been revealed on SAReferees.co.za that their Varsity Cup competition has this season been given dispensation from the iRB to trial a new points scoring system. For some referees Alain Rolland has done more to promote the un-acceptance of the tip/spear tackle within our game than what the iRB has managed to do in 4 years of memo writing. 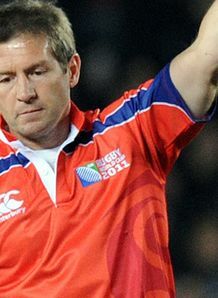 With the recent sending off of a player in a high profile Rugby World Cup play-off match, the Dangerous Tip Tackle has become a focus of much of the rugby public, and the seemingly heretofore unknown "Spear Tackle Memorandum" has received its greatest public airing since it was first promulgated by the IRB in June 2009. If you look through ALL of these better known examples of sanctioned tip tackles, in every case, you can clearly identify each of what I call the five "tells" of a tip-tackle. Well the Welsh will still be emotional, and there will be lots of questions about if Alain Rolland was right to Red Card Sam Warburton for that tip tackle. Unfortunately for the Welsh, yes he was.